The Santa Monica Pier is a landmark double-jointed pier that is popular amongst locals and tourists alike. Over 100 years old, the Pier is rich with history and good times for all. The Pier is open 24/7 (although some shops hold more specific hours) and offers rides, arcade games, live music, restaurants, dozens of exciting seasonal events and more. Be sure to visit Pacific Park on the Pier for an array of rides perfect for both adults and children, including roller coasters, the historic carousel, and the Ferris Wheel. Stop by Playland Arcade and test all your skills for fun prizes. The Aquarium, located beneath the carousel, is the perfect place to experience marine life without getting wet, and exhibits over 100 local species, provides hands-on activities for children as well as daily educational programs. Explore your wild side and try something new by flying high above the Pier with a class at Trapeze School. For those who want excitement without heights, Blazing Saddles Beach Rentals offers bicycle rentals and tours. Go on a themed tour on a double-decker bus with Starline Tours, or explore an hour-long historical walking tour and learn about how the Pier has changed over 100 years. Don’t miss S.T.E.A.M. Machines – a one day festival for innovators who want to showcase their creations. Or get fit with friends with ROGA: run a half marathon followed by an hour guided yoga class and mediation. Shop ‘till you drop and find the perfect gifts for friends and family with an array of souvenir shops and at Pier Shop & Visitor Center, Pier Bait and Tackle for fishing on the Pier, Marlene’s Beach Comber for all beach lounge needs, 66 to Cali for historical trinkets or Oatman Rockshop for collectibles and creative souvenirs. For a culinary respite, Santa Monica Pier has much to offer. Mariasol Cocina Mexicana restaurant offers margaritas and mouth-watering Mexican fare with gorgeous views.Sample Bubba Gump Shrimp Co. Southern Dixie-style seafood and ribs. Pier Burger gourmet burgers, custards, and shakes is a great location for a quick bite for the whole family.Or enjoy the light ocean breeze with patio dining and delicious seafood options at The Albright. Live music and dancing paired with all-American cuisine at Rusty’s surf bar. For dessert, Soda Jerks brings back the classic soda fountain in addition to dozens of handmade sweet treats of all kinds. And for those who can’t decide, try any of the classic options at Pac Park Food Court. 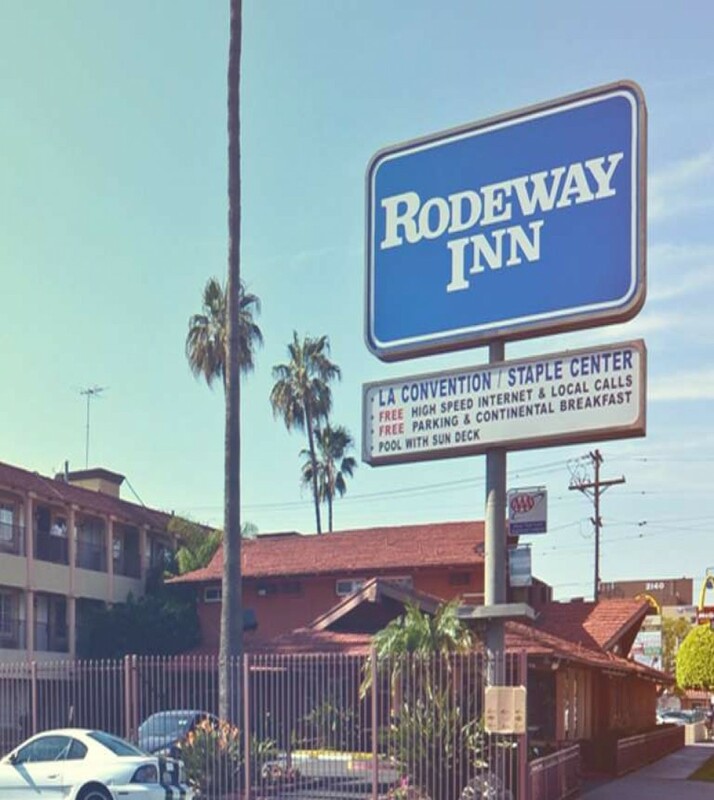 Centrally located in downtown Los Angeles, Rodeway Inn & Suites offers budget-friendly accommodations for the whole family and is a short distance from many attractions and only 14.6 miles (approximately 22 minutes) from Santa Monica Pier. Enjoy spacious rooms, a swimming pool, friendly service, complimentary continental breakfast and more. For lowest rates, book direct at www.laconventioninn.com.